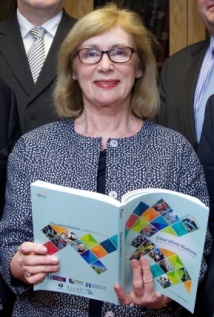 Minister for Education & Skills Jan O’Sullivan addresses educators and friends gathered in the National University of Ireland, Merrion Square Dublin, for the launch of Education Matters Yearbook 2015-2016. It’s a real pleasure to join you all here again this evening to launch the new Education Matters Yearbook. As with previous years, the scale and scope of the publication is impressive. All credit to those involved in putting the yearbook together – it is a hugely valuable resource for all of us involved in education in Ireland, and we are indebted to you for all the long hours that must have been involved. For me, one of the great advantages of Education Matters Yearbook each year is that it gives us the opportunity to reflect on the year we have had, and to once again lift our heads to imagine what should be on the horizon for the coming year and beyond. Over the last year, we have achieved a great deal together. A new CAO points system has been published, which will remove some of the unnecessary pressure on our students, while encouraging them to be ambitious with their learning. Agreement has been reached with one of the teacher unions on reform of junior cycle, and I hope agreement with the other can be achieved over the coming months. Twenty-five new apprenticeships have been identified, and are currently being developed so that they can enrol students during 2016. The Budget saw the first improvements to primary school class sizes in almost a generation, as well as substantial improvements to the staffing and middle management of our second-level schools. The Centre for School Leadership has been established – a topic well covered in this publication. A new Digital Strategy has been published that will transform our approach to using technology to improve teaching and learning. Our new school building programme will see an end to the use of prefabs in our schools by 2021, and will allow for major building projects in 310 schools. 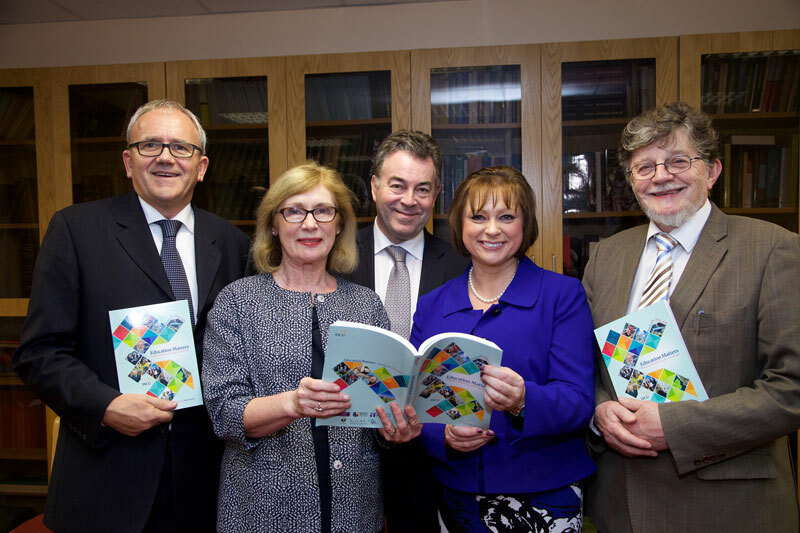 The Technological University Bill has been published, paving the way for the development of TU applications in four regions of Ireland. 2016 will see many further developments across education. The free pre-school year is being extended, and the first education-focussed inspection reports of pre-school settings will be published in January. A review of PLC provision will ask important questions of that sector, while a National Skills Strategy will shape our overall skills approach into the future. Of particular interest to those in Higher Education will be the completion of the work of the expert group on future funding of higher education – work that I have no doubt will ask questions of all of us. All of this, and much, much more, lies before us next year. As of course does an election, the results of which may well have the biggest impact of any measure on priorities in education. From my perspective, we must build on the work that has been done over recent years to agree a shared set of priorities for investment in education. The last two budgets have seen the education budget increase by over €200m. Welcome, but still not enough. By agreeing priorities amongst ourselves, we give ourselves the best chance of persuading the Irish people and all of Government to increase funding to education. An occasion like this also gives me a welcome opportunity to respond to a lively public debate. Diarmuid Martin spoke last night at the annual Schools Mass in the Pro-Cathedral. I couldn’t attend the mass, but it certainly made for interesting reading. This is a valuable contribution to the debate around patronage and pluralism in our primary schools. And there have been many others over recent months. Paddy Monaghan, along with many others, has cogently argued for changes to the Equal Status Act to make sure that local children can attend local schools, regardless of the religious beliefs of their families. Atheist Ireland has argued for the repeal of rule 68, as well as for the creation of a national network of secular state schools, and an end to the use of private patrons. My role requires that I do more than simply accept any one of these positions as inarguable. Because the nature, form and landscape of our education system cannot be dictated by any one group. We must strive to develop a shared idea of a system that can best serve the needs of our people. And we must constantly strive to improve what we have in place already. Over the last couple of weeks, I have begun meeting with different patronage bodies, to reinvigorate the process of divesting or reconfiguring our school system to allow for greater parental choice. Those meetings are continuing – just this evening, I met with ETBI, and will meet with Educate Together and the Church of Ireland next week. Once this round of meetings has concluded, I will outline my plans for reinvigorating our national policy in this area. But of course public debate cannot and should not be restricted to meetings between a Minister and some of the education stakeholders. And so, given the level of interest in these issues, I want to speak tonight about two related issues, which aren’t a feature of those discussions – our curriculum at primary level, and how we prioritise admissions to schools. Rule 68 is archaic. I will repeal it. It may have survived for 50 years, but in January it will be removed, along with any other rules that don’t speak to the diverse and welcoming nature of our modern school system. Of course, changing a rule is only one small step. The development of a new curriculum for all of our primary schools, which will provide education about religion, beliefs and ethics, will be more important in many ways. That curriculum will give every child a shared knowledge of the religions and beliefs held by people in Ireland and across the world. And it will imbue in every child an ethical understanding of relationships between people, and how we connect to our world. Consultation on that curriculum is underway. When complete, it will trigger another necessary discussion – how much time should be spent on it? And indeed how much time should be spent on all religious education in our schools? Currently, 30 minutes of each school day is allocated to religious education. Is that enough, or is it too much? We want our children to develop a strong, ethical spirit, and an understanding of their place in the world. But we also want them to learn many other things. We want them to be physically active and fit, but we devote less than half of the time to PE that is devoted to religion. We understand that an early appreciation of science can engage and astound our children in wonderful ways, but science education also gets less than half the time that religion does in our curriculum. And of course there are many other calls, from philosophy to coding to modern languages and financial education, all of which it is argued should feature on the primary curriculum. We also know that there is a limit to what can be squeezed into a curriculum. We don’t want a seven-year-old child to spend 14 hours a day in school. And so we will have to make choices. Moving away from the curriculum, we have a particularly lively debate on-going over school admissions at present. Earlier this year, I published an Admission to Schools Bill. That Bill isn’t perfect, but I am proud of it. It would put an end to the charging of fees just to apply for a school place. It would end the soft barriers that some of our schools erect in the way of children with special needs. And the Bill will bring openness and transparency to all school admissions. At this point in the political cycle, I have concluded that it is unlikely that this legislation will pass through both houses of the Oireachtas in advance of the election – there is only one sitting week left before Christmas, and it is unclear how many sitting weeks we’ll have in the New Year in advance of the election. While this may be a disappointment to many, including myself, it is clear that this Bill would only go some of the way to addressing the issues currently fuelling public debate. The issue of the need to amend the Equal Status Act was not a feature of the consultation paper published in advance of the Admission to Schools Bill. Therefore, no amendment to the Equal Status Act was included in the published Admission to Schools Bill. I accept that the current position cannot and should not be maintained. The Equal Status Act must be amended so that local schools are required to prioritise local children, no matter their religion. We must build in protection for the small number of minority faith schools which serve dispersed communities – effectively eliminating minority faith education would represent a departure from, and not a move towards, a diverse and pluralist education system. My party has agreed that our manifesto will include a commitment to do exactly that. And we are already looking at possible drafts of what that legislation might look like. There are other issues which also need to be dealt with during the passage of Admissions legislation. For example, there has been an ongoing discussion over the number of places that a school may reserve for the children of past pupils. I have put my own personal opinion on record, that a limit of about 10% of school places might be a reasonable level at which to pitch this. Others argue that no such exemption should be provided for, while still other believe that a higher limit of about 25% would be appropriate. We haven’t reached agreement on that point, but I have received legal advice that this threshold will have to be written into the primary legislation rather than only placed into secondary regulations. 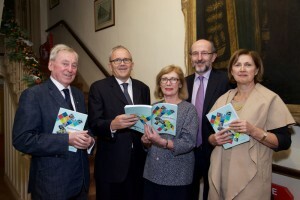 Dr Maurice Manning Chancellor National University of Ireland, Brian Mooney Editor Education Matters Yearbook, Jan O’Sullivan Minister for Education & Skills, Professor Brian MacCraith President Dublin City University, Dr Attracta Halpin Registrar National University of Ireland, pictured at the launch of Education Matters Yearbook 2015-2016. One thing is abundantly clear: we need comprehensive, radical admissions legislation. It may be no harm that this is achieved through one piece of legislation, enacted early in the lifetime of the next Oireachtas. This piece of legislation must be one we can all unite behind, and which will effectively tackle all of the inequities that are allowed by a lack of regulation of school admissions. I have focussed here this evening on some of the issues that are currently dominating public discussion. But as this publication so accurately captures, the education sector has an enormous breadth of ongoing debates, all of which need to be resolved in public policy. I look forward to that debate.